Where is it? 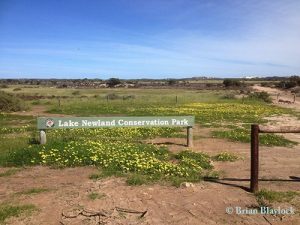 : Lake Newland Conservation Park is a narrow stretch of land extended along the coast for approximately 38 km from 20 km north of Elliston towards Venus Bay. Access to the park is by Walkers Rock Road in the south and centrally via Sheridans Lane, both off the Flinders Highway. Parking bays are available at the Walkers Rock entrance. History: The park was first proclaimed on 1 August 1991 with additional areas added on 27 June 1996 and 14 October 2010. 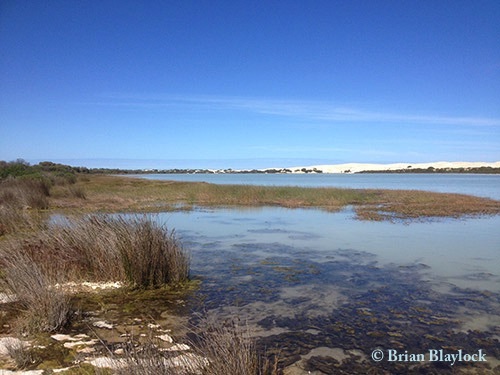 Section 214 was gazetted in 1995 as a Coastal Conservation and Recreation Reserve under the Crown Lands Act 1929 and reclassified on 14 October 2010. 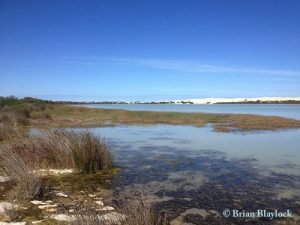 Limestone Plains – probably originally dominated by sheoak woodlands (Allocasuarina verticillata), but now modified by past clearing. There are a number of freshwater springs or soaks along the eastern edge of the lake – Chiltata Spring, Weepra Spring and Three Springs.